I chatted with Mike Leigh in Leeds, where he was attending the Leeds International Film Festival, hot on the tail of Peterloo’s premiere at the HOME cinema in Manchester. “Yeah it was great. It was part of the London Film Festival – but in Manchester. It was a very inspired move on somebody’s part to do that. It was great.” Leigh’s assistant had been eager to inform me before the interview that the premiere was specially held in Manchester despite being part of the BFI London Film Festival, and that this was no mean feat. Ruminating on what Peterloo means for posterity led to a stunning revelation about the composition of what I remember being a rather arresting scene. “Towards the end of the film, the night before the actual day of Peterloo, you see Nelly in bed with her husband and the grandchild. [Me: and they wonder “What’s 1900 going to be like?”] Yeah! Now we actually put that scene together, in the location, we actually wrote that scene just before we shot it, about a week away before my first grandchild being born. So, I had been reflecting during the pregnancy of my de-facto daughter-in-law, “what sort of a world is this kid, born in August 2017, going to experience in 2100?” I mean it’s almost impossible to reflect what sort of world that would be on all sorts of levels… if indeed we have a world at all at the end of this century…” Cheerful stuff! Mike Leigh has a truly epic filmography stretching almost five decades, and that’s alongside an equally epic stage history, and though he says Peterloo is the first of his films which “directly deals with political issues”, all of his work is in some way political: “it’s the responsibility of the artist to deal with society and to reflect society and therefore by definition you have a political responsibility, however that’s interpreted. This appeal to objectivity brought to mind the objective-lens stance I highlighted in my review, and from there I thought of something about Peterloo that might appear more interpreted. The upper-class characters, you see, were just so repulsive that I had to find out whether they were getting a fair, accurate hearing or whether they were being demonised, and the answer only makes Peterloo the more horrifying. 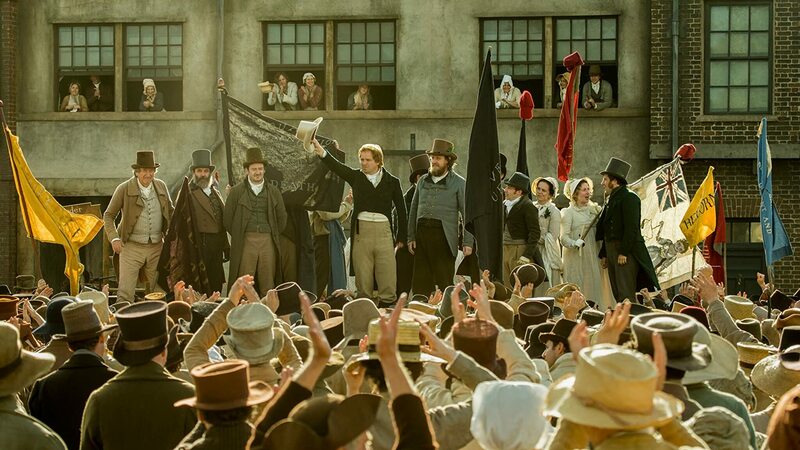 Peterloo is out in cinemas now, distributed by eOne Entertainment.